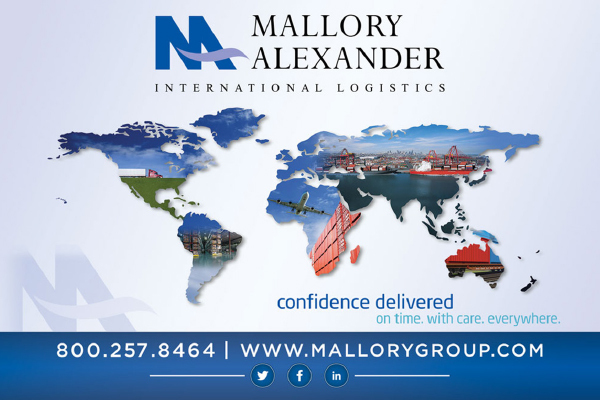 Mallory Alexander International Logistics is a leading third-party logistics (3PL & 4PL) provider. We support manufacturers, retailers and other suppliers in the storage and shipment of their valuable cargo, and we do it with confidence—on time, with care, everywhere. We recognize the invaluable role our customers play in the international economy and in lives around the world. We navigate the complex logistics landscape and build safeguards into our processes, ensuring accuracy and providing our customers peace of mind. We create reliable yet nimble systems to meet our customers’ dynamic needs, at every touch point, every time. Your biggest challenges are met with creativity and supported by our offices around the world and warehouses at strategic U.S. locations. As a financially secure company, Mallory Alexander has the stability and commitment to develop long-term relationships in global commerce. Rely on Mallory Alexander for superior supply chain performance around the world. Mallory Alexander works to establish partnerships with our customers to develop customized business solutions that fit their particular needs, while ensuring that their corporate goals are met. Combining best in class operating procedures and systems with a comprehensive network of agents and service providers allows customers to maximize the value of their supply chain spend. At Mallory Alexander, we align our objectives with our customers’ objectives. As a solution provider first, we are not bound to a limited group of suppliers or services officers. Offering value added services such as customs brokerage, white glove delivery, fulfillment and repackaging services, along with a select team of dedicated employees, clearly distinguishes us from other third party logistics providers. Our commitment to your success requires nothing short of excellence. Mallory Alexander is fully licensed, ISO9001:2015 and C-TPAT certified. We participate in government agencies and third party training and seminars to ensure the highest degree of compliance with the US government regulations. We are a winner of the President’s E-Award for Exporting Excellence and the President’s E Star Award for the promotion of U.S. Exports. Mallory Alexander offers a proud tradition of innovative logistics solutions, tailored quality services, and leading edge technologies delivered every day by the best professionals in the business. We recognize that people are our greatest asset and our success is based on the integrity of people who have a passion and commitment to serve their customers. Mallory Alexander is right-sized with the expertise and flexibility that our customers demand. We are proud to call Memphis, TN home for our company headquarters and the foundation for all our global offices.